Every year, my homeroom advisory draws names for Secret Snowflakes. A few years ago, I made an infinity scarf for Grace and shared that pattern with you. This year, I drew Sophie's name and since her favorite color is purple (like mine! ), I decided to make her a hat and an infinity scarf. It needed to be something quick, so I bought 3 skeins of Lion Brand Hometown Super Bulky yarn and hoped for the best! The result is a toasty warm and gorgeous combination! 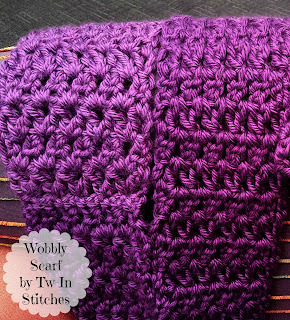 Both the scarf and the pattern use the wobbly DC2TOG method of V stitches. 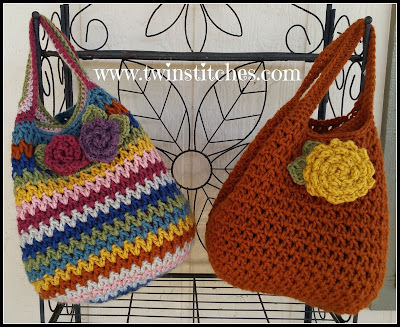 I made both in just under 3 hours using super bulky yarn and an N (10 mm) hook. I hope you like these two designs! Click here to add this project to your Ravelry queue. *the chain 2 at the beginning of each round does not count as a stitch. Row 1: Using a magic circle, chain 2. Crochet 12 DC into the magic circle. Close the circle and slip stitch into the top of the first DC. Row 4 (Wobbly Row): Chain 4 (counts as one half of a DC2TOG). Start a DC2TOG in the same space, skip one stitch and complete the DC2TOG in the next space. *Chain 1, start a DC2TOG in the same space, skip one stitch and complete the DC2TOG in the next chain stitch. * Repeat from * to star around until you finish the last DC2TOG. Chain 1, DC in the same stitch and slip stitch to the third chain to end the row. Row 5 (Wobbly Row): Slip stitch into the chain 1 space. Chain 2 and DC into the next chain 1 space. *Chain 1 and begin a DC2TOG in the same space. Complete the DC2TOG in the next chain 1 space. * Repeat from * to * around. Following final chain 1, slip stitch into the top of the first DC to join. Row 6-9: Repeat Row 5. Row 1: DC in the fourth chain from the hook.Chain 1. *Start a DC2TOG in the same stitch. Skip one chain. Complete the DC2TOG in the next stitch. * Repeat from * to * across, ignoring the skip one chain to finish the last DC2tog. Chain 3 and turn. Rows 3-54: Repeat Row 2. After completing row 54, fasten off. Bring the two ends of the scarf together without twisting. Sew the two ends together using a whipstitch or other. Weave in ends. 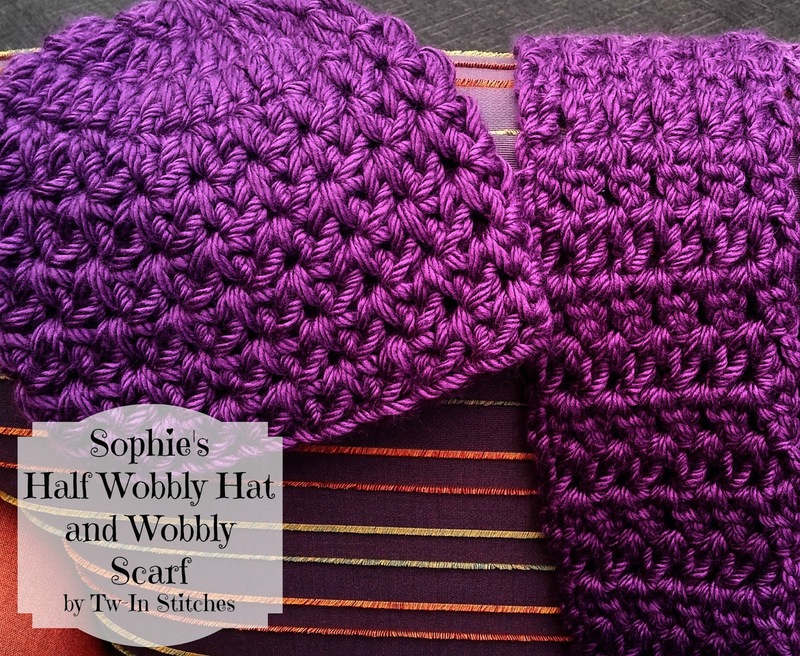 I hope you enjoy making Sophie's hat and scarf as much as I did! Oh, my goodness! I've been crocheting up a storm trying to get rid of my stash and every time I think I've made some headway, I find another bag, another box, and more skeins of yarn! I'm flabbergasted by the amount of yarn I have. 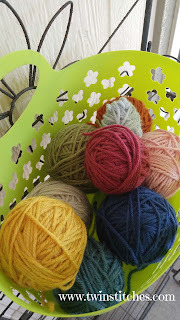 The yarn that frustrate me the most is the balls of partial skeins of yarn (a.k.a. the dreaded scraps). I have a ton of them leftover from blankets scarves and other things I've made. I had quite a few balls of yarn left from when I made the Sophie's Universe blanket earlier this year. I used Vanna's Choice in ten different shades and I had enough left that I thought I might be able to make a handbag. 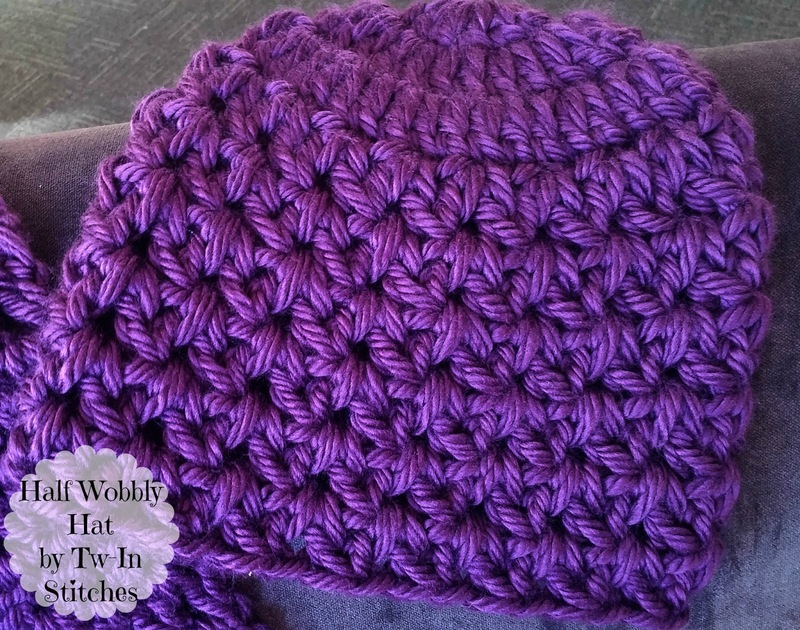 As I started, I thought "Why not use the wobbly pattern?" You guys, seriously! 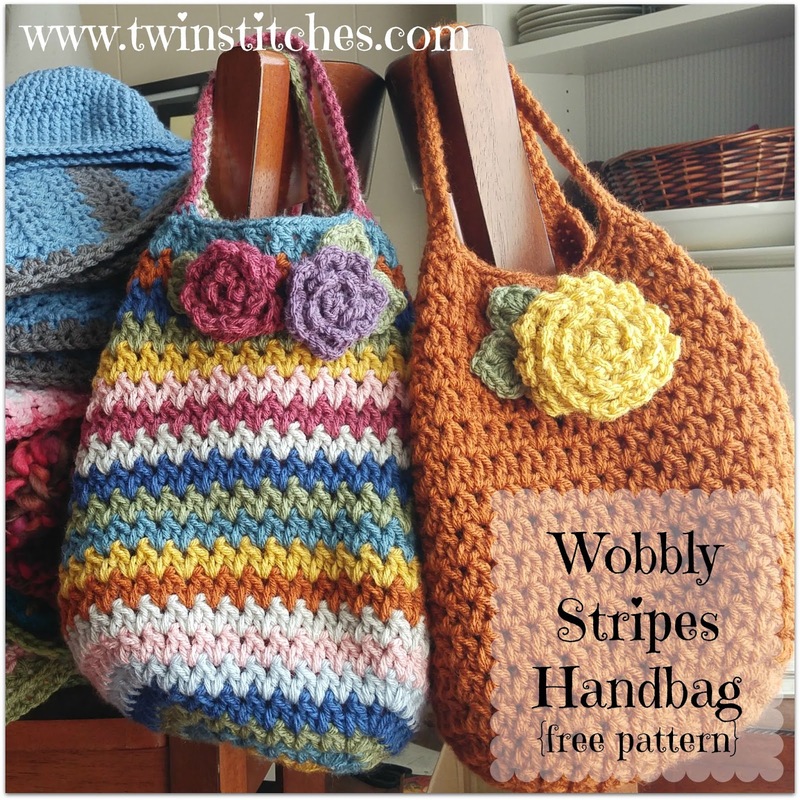 The Wobbly V-Stitch makes this bag so fun and quick to make. The two bags pictured were made in the last 24 hours! I started by using up the two skeins of the Rust colorway. I thought, for sure, that I would use it more in my blanket, but it bothered me every time I used it and ended up avoiding using it. The good news is that I have a sister who loves orange, so this bag was made with her in mind. I decided to start with a Wobbly Square and continue with Wobbly Stripes worked in the round. 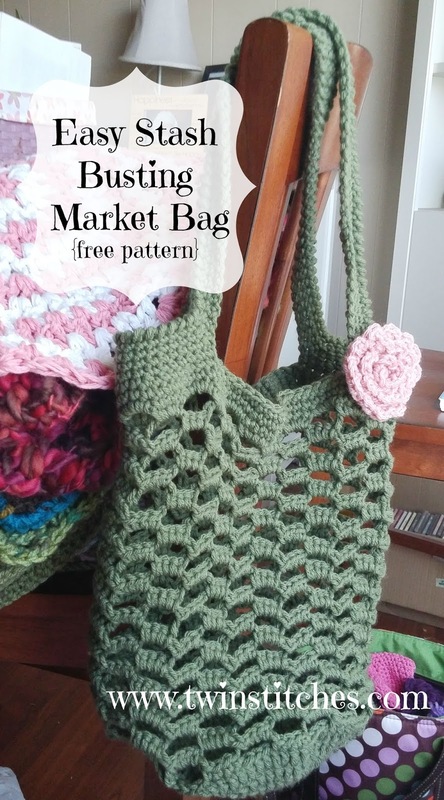 The great thing about this pattern is that you can make the bottom of the bag bigger or smaller depending on your beginning square. 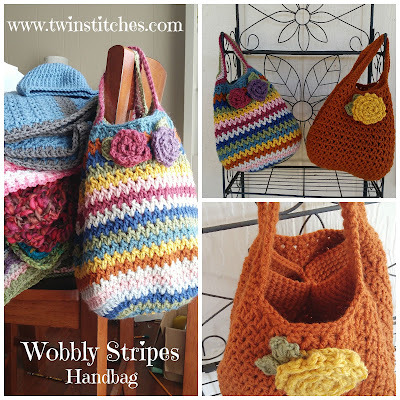 Also, you can choose to make the bag deeper by repeating the Wobbly Stripes rows. I also added a button to close the top of the bag in a different way! Working with one color: If you decide to make your handbag in one color instead of multiple colors, you will not be fastening off. You will need to be able to work your way up to the next row. It's easy to do! Join to the top of the first dc2tog, slip stitch into the chain 1 space. Chain 3. Double crochet into the next chain 1 space. Chain 1 and begin the dc2tog part of the pattern. See? Easy! Row 1: Using Color 1, crochet a magic circle, chain 2 (does not count as a stitch). Crochet one dc2tog, then chain 1. Repeat from * to * seven more times. Join to the top of the first dc2tog. Fasten off. Close magic circle. In each of the following rows, all stitches will be worked in the chain 1 spaces of the previous row. Row 2: Using Color 2, using the standing double crochet method, join the new color in one of the chain 1 spaces, but only pull through the first two loops (beginning of first dc2tog started). Yarn over and complete the dc2tog in the next chain space. Chain 1. Begin the next dc2tog in the same space, complete in the next chain 1 space. To form the first corner, we will continue to work in the same space. Chain 1, double crochet, chain 1, double crochet, chain 1 all in the same space. To complete the corner, begin the next dc2tog in the same space and complete it in the next chain 1 space. Begin the next dc2tog in the same space, complete in the next chain 1. 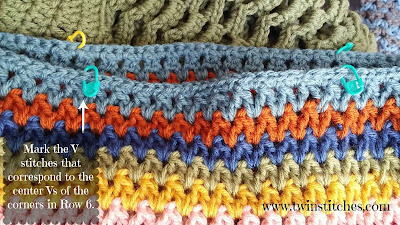 *Make a corner (Chain 1, double crochet, chain 1, double crochet, chain 1 all in the same space. To complete the corner, begin the next dc2tog in the same space and complete it in the next chain 1 space.). Begin the next dc2tog in the same space, complete in the next chain 1 space. * Repeat from * to * two more times. Join to the top of the standing dc2tog. Fasten off. Row 3: Using Color 3, join using the standing double crochet method in any space but a corner. Remember to only pull through the first two loops (beginning of first dc2tog started). Yarn over and complete the dc2tog in the next chain space. Chain 1. Begin the next dc2tog in the same space, complete in the next chain 1 space. Continue this pattern, dc2tog, chain 1, begin next dc2tog in the same space, until you reach a corner. Complete the final dc2tog in the corner, chain 1, dc, chain 1, dc, chain 1, start dc2tog in the corner and complete in the next stitch. Continue around joining to the top of the standing dc2tog. Fasten off. Rows 4-6: Repeat row 3. Alternate colors according to the pattern you established. Rows 7-20: For these rows, we are going to ignore the corners and consider only their chain 1 spaces! This row is only dc2togs and chain 1s. 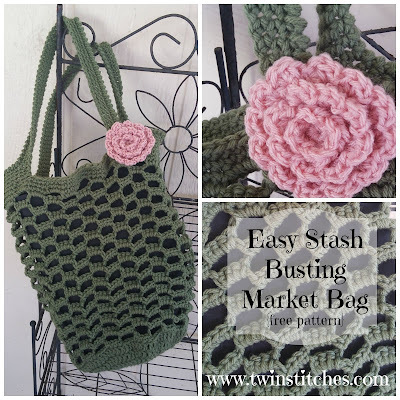 Join using the standing double crochet method in any space. Complete the dc2tog in the next chain space. Chain 1. Begin the next dc2tog in the same space, complete in the next chain 1 space. Continue this pattern, dc2tog, chain 1, begin next dc2tog in the same space. End with the find dc2tog in the same chain 1 space as your first stitch, chain 1 and join to the top of the first dc2tog. Fasten off and weave in ends. Note: If you like, you can continue this pattern beyond these rows. The more rows you add, the deeper your bag! I marked my V-stitches and moved the stitch markers to the single crochets in preparation for Row 22. Row 22: Let’s make the handles! 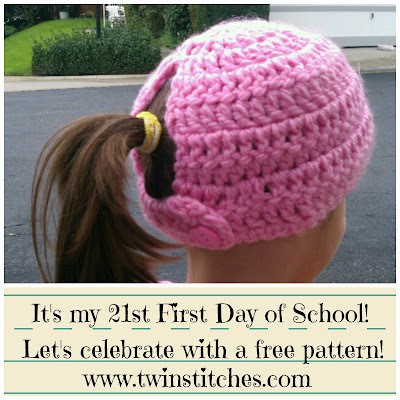 There is a lot of counting going on for the rest of the pattern, so make sure to check frequently! If you are using the same color, chain 1. SC in the same stitch as join. (If you are using a different color, make a standing SC into the first stitch from the last row.) SC in the next 22 stitches. Slip stitch into the next stitch. Chain 32 (you can do more if you want longer handles!). Skip 16 stitches and slip stitch into the 17th stitch. SC into the next stitch and in each of the next 29 stitches (30 scs). Slip stitch into the next stitch. Chain 32. SC into the next stitch and each of the next 6 stitches. Slip stitch to the top of the first SC to join. (2 sets of 30 single crochets, 4 slip stiches, 2 sets of 32 chains). Note: if you are changing colors each row, I would recommend using the same color for this row and the next. Row 23: Chain 1, SC in the same stitch** and in each of the next 22 stitches. Skip the slip stitch and single crochet into each the 32 chains. Skip the slip stitch and single crochet into the next 30 stitches. 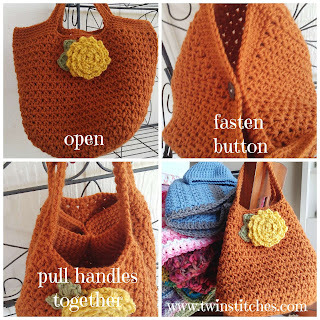 Skip the slip stitch and single crochet into each the 32 chains. Skip the slip stitch and single crochet into each of the next 7 stitches. Slip stitch to the top of the first SC to join. Fasten off. **Remember that if you are joining another color, you can join using the standing SC instead of joining and chaining 1 before the SC. Row 24: Chain 1, SC in the same stitch and in the next 22 stitches. Skip the next SC and SC in each of the next 30 stitches. Skip the next SC and SC in each of the next 30 stitches. Skip the next SC and SC in each of the next 30 stitches. Skip the next SC and SC in each of the next. Join to the top of the first SC. Fasten Off. Row 25: Chain 1, SC in the same stitch and in the next 22 stitches. Skip the next SC and SC in each of the next 28 stitches. Skip the next SC and SC in each of the next 14 stitches. In the next, stitch SC once and slip stitch into the same stitch. Chain 2, skip 2 stitches. Slip stitch and SC into the next stitch. This forms the button hole. SC in each of the next 13 stitches. Skip the next SC and SC in each of the next 28 stitches. Skip the next SC and SC in each of the next 7 stitches. Join to the top of the first SC. Fasten Off. Row 26: Chain 1, SC in the same stitch and in the next 22 stitches. Skip the next SC and SC in each of the next 26 stitches. Skip the next SC and SC in each of the next 30 stitches. Skip the next SC and SC in each of the next 26 stitches. Skip the next SC and SC in each of the next. Join to the top of the first SC. Fasten Off. If you want thicker straps, you can keep going beyond Row 26, but I think 4 rows is enough! To finish, weave in any ends you have. Sew a button on the inside of the bag opposite the button hole. 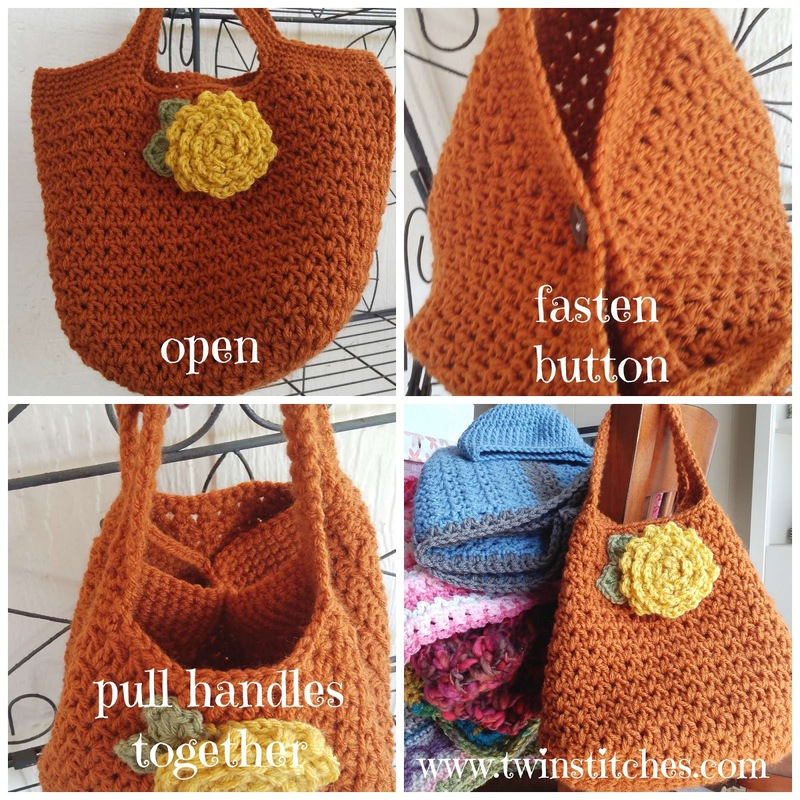 When you slip the button through the hole and hold the handles, the bag will close up quite nicely! Feel free to add your favorite flower or other accessory!